The youth are out there spending again. That could be good for retail stocks, judging by this new data. The market may want to revisit its negative reaction to the strong second quarters from teen apparel chains such as American Eagle Outfitters (AEO - Get Report) and Abercrombie & Fitch (ANF - Get Report) . Because judging by one new survey, teens and college kids are poised to spend big on "stuff" this holiday season. And not just Apple's (AAPL - Get Report) latest pricey iPhone, think $100 Nike (NKE - Get Report) sneakers, $50 Zara blazers and Abercrombie & Fitch's latest destroyed denim. Teens once again chose consumer goods as their top priority for spending, according to Evercore ISI's 8th annual "Back to School" survey. Meanwhile, 18 to 23 year olds continue to pull back on "experiences" for spending on "consumer goods" and "saving/paying down debt." 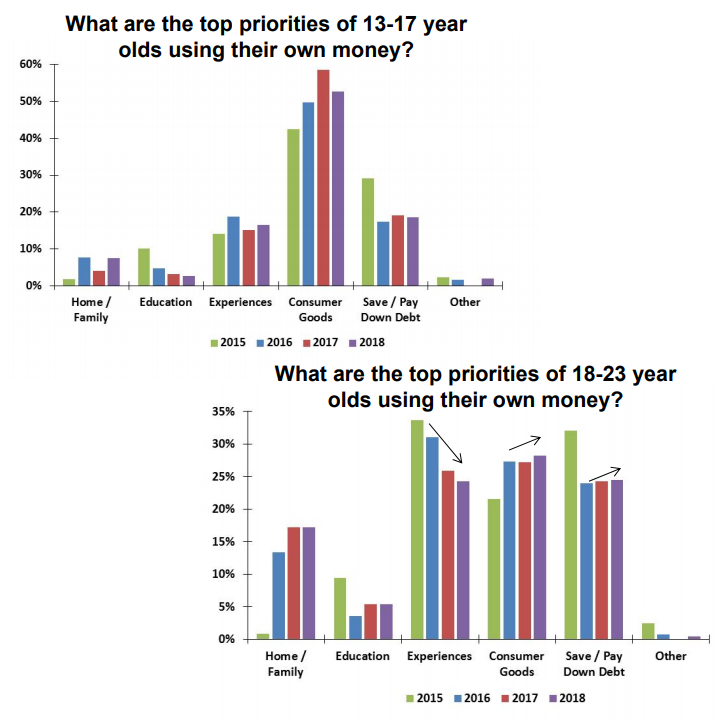 The top priority for 18 to 23 year olds, says the survey, was "consumer goods" which just edged out "experiences." Robust spending intent by these groups coincides with steep declines in their respective unemployment rates. The unemployment rate for 16 to 19 year olds dropped to 12.8% in August from 13.8% a year ago, according to the Bureau of Labor Statistics. Those in the 20 to 24 year old bucket saw the unemployment rate hit 6.8% in August, down from 7.2% last year. The youth is spending. Source: Evercore ISI.